The proliferation of reality TV started in the United States with MTV’s The Real World in 1992, and spread globally with Survivor and Big Brother a few years later. The success of these programs proved that nonscripted shows full of nonactors could deliver huge ratings at a fraction of the cost it took to produce scripted shows. Production companies and TV networks took notice, and by the early 2000s, the prime-time schedule was being taken over by so-called reality. Today, reality programming consists of two broad categories: the “fly on the wall” show in which cameras document the lives of ordinary people, and reality game shows in which groups of people compete for cash and prizes. In both cases, viewers expect drama, conflict, humor, and a satisfying conclusion, just like scripted television. How do producers accomplish that with an “unscripted” show? By leaving very little to chance. The extent to which many of these shows are rigged might surprise you. “REALITY”: Cameras follow home buyers as they choose between three properties shown to them by a real-estate agent. “REALITY”: Cameras follow the Robertson family of Louisiana, headed by patriarch Phil, who owns a successful business selling duck calls. The show portrays the Robertson men as bearded hillbillies in full camo gear. “REALITY”: Cameras follow Ernie “Turtleman” Brown as he helps fellow Kentuckians whose properties have been invaded by nuisance wildlife. He catches the critters with his bare hands and then lets them go in the woods. “REALITY”: Cameras follow the exploits of cliques of well-to-do women from various American cities. Episodes feature fights, betrayal, drinking, and sexual situations. REALITY: The gossip website RadarOnline posted photos of the cast and crew of Real Housewives of New York City filming a “spontaneous” street scene: “Carole Radziwill and Heather Thompson were taking instructions from producers, shooting multiple takes, and waiting for breaks in dialogue to ensure cameras were set up.” The gossip site also reported that Real Housewives of Atlanta cast member Walter Jackson confessed that—at the behest of producers—he pretended to be Kenya Moore’s boyfriend “to give Kenya a story line.” Contrary to what viewers saw, the two were not a couple. “REALITY”: At the beginning of each season, thousands of aspiring singers line up in various cities for a chance to audition in front of the celebrity judges. If the judges deem a singer good enough, he or she gets a “golden ticket” to compete on the show in Hollywood. Singers not good enough are often ridiculed (on national TV) before being sent home. REALITY: By the time most singers get in front of the celebrity judges, their fate has already been determined. In 2011 a former contestant who identified herself by the fake name “Maria Saint” revealed that several of the top singers didn’t even have to audition. They’d been “recruited” for the show by talent scouts. And those huge lines full of hopefuls we see on TV were actually filmed weeks or months before the celebrity judges showed up. The hopefuls sing for the show’s producers, after which, according to Saint, each singer is given a piece of paper with the producer’s name along with a code: “Y” means the singer is good enough to move on; “K” means the singer isn’t great but has potential; and “N” means the singer’s not good enough for the show…but still might still get in front of the judges. “Take my advice,” wrote Saint, “if you’re an ‘N’ and you want to see the process and you’re okay with the fact that you may be humiliated and that’s all right with you, then by all means, take the chance-of-a-lifetime experience.” Saint kept her identity secret, fearing she could be sued for up to $5 million for breaching a confidentiality agreement that all hopefuls must sign. SHOW: Kourtney and Kim Take New York, E! “REALITY”: Cameras follow the exploits of the Kardashian sisters as they navigate the perils of life, love, and family. In one episode in 2011, Kim flew to Dubai to have a heart-to-heart talk with her mom, Kris Jenner, to tell her that she was going to divorce her husband, Kris Humphries. REALITY: After the show aired, a photograph of Kim and her mother leaving a soundstage in Los Angeles wearing the exact same outfits, hairstyles, and makeup they had in “Dubai” showed up on the Internet. And the photo was taken on December 6, 2011—a full week after news broke that Kim was divorcing Humphries. Not only was the location faked, so was the entire conversation between mother and daughter. “REALITY”: Cameras follow the highly competitive world of child beauty pageants. REALITY: When RadarOnline broke the story about the scripted scenes in Real Housewives of New York City, one of the online commenters was former Toddlers & Tiaras pageant mom Darci McHenry, who wrote: “We had to ‘re-shoot’ things that started out spontaneously. We were re-fed lines to re-create a ‘missed’ moment. Plus, you’re mic’d the whole time. You can be addressing one person, and editors can come in and splice it to make it look like you’re addressing someone else because it makes for better television.” She added that one scene of a little girl “spontaneously” singing a song was shot six times. “REALITY”: Twenty contestants compete for a chance to become head chef at one of Gordon Ramsay’s restaurants. Each episode features a dinner service where the British celebrity chef yells bleeped-out profanities at the contestants, smashes poorly cooked meat with his bare hand, and often shuts down the service early. One chef is eliminated each week, at the sole discretion of Ramsay. REALITY: Regular viewers often ask, “How did some of these clueless chefs even get on the show?” In a 2013 interview with Emmy magazine, Ramsay answered that question during a rant about “the muppets I have to work with.” He said, “There’s fifty percent cast for character, and there’s fifty percent cast for talent.” That explains why obviously inferior chefs remain on the show after better chefs have been eliminated—it makes for better drama. “REALITY”: Cameras follow restaurant “fixer” Charles Stiles as he assists restaurant owners who are losing money and can’t figure out why. Stiles’s company comes in at night and secretly installs hidden cameras. Then company operatives pose as employees and customers while Stiles and the restaurant owner sit in a control room and watch what transpires. In every episode, restaurant employees are caught engaging in some kind of shady activity, which leads to a heated confrontation, dramatic firings, and a grateful owner. REALITY: If it seems as if some of the “problem employees” that Stiles’s company exposes are paid actors (because who would act like that and then allow themselves to be on TV? ), it’s because they are. In 2013 a former employee of Big Earl’s Greasy Eats in Cave Creek, Arizona, told the Sonoran News that when the Mystery Diners production crew filmed an episode there, they brought in paid actors. The confrontations were staged, and some required several retakes. “REALITY”: Cameras follow five young adults—four Amish and one Mennonite—who decide to leave their rural, technology-free, religious upbringings in Lancaster County, Pennsylvania, and go to New York City. They live the “English” life for a while before deciding whether or not to go back to their traditional homes. As the allegations of fakery kept coming in, TLC revised the storylines throughout the first season to reflect the fact the young men and women weren’t as “pure” as the show had made them out to be. “REALITY”: Cameras follow boys and girls at a summer camp. “REALITY”: Cameras follow professional buyers as they bid on the contents of abandoned or unpaid storage units. “REALITY”: Cameras follow Nicole “Snooki” Polizzi and Jennifer “JWoww” Farley in this Jersey Shore spin-off as they—like Kourtney and Kim (and many other reality shows)—navigate life and love. “REALITY”: Popular music artists mentor up-and-coming singers who are chosen via “blind” auditions. The mentors can only listen to the contestants’ voices before deciding whether to take them on as students. Winners are ultimately determined by a fan-voting system. A contestant may be removed from the show at any time “for any reason whatsoever,” even if they are “winning” with the public. Failing to follow the rules or divulging inside information could result in the contestant being sued for $100,000 to $1 million. This article is reprinted with permission from Uncle John’s Canoramic Bathroom Reader. Weighing in at a whopping 544 pages, Uncle John’s CANORAMIC Bathroom Reader presents a wide-angle view of the world around us. It’s overflowing with everything that BRI fans have come to expect from this bestselling trivia series: fascinating history, silly science, and obscure origins, plus fads, blunders, wordplay, quotes, and a few surprises. Since 1987, the Bathroom Readers’ Institute has led the movement to stand up for those who sit down and read in the bathroom (and everywhere else for that matter). 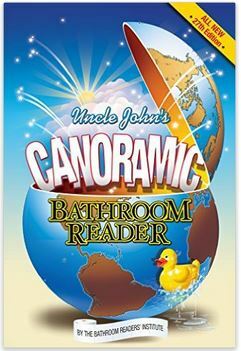 With more than 15 million books in print, the Uncle John’s Bathroom Reader series is the longest-running, most popular series of its kind in the world. If you like Today I Found Out, I guarantee you’ll love the Bathroom Reader Institute’s books, so check them out! Surprised the author(s) didn’t go after one of the most onerous of all faked reality shows, “Alaskan Bush People”, featuring Billy Brown and his “clan” of half-baked bush’ers, who live in hotels in Washington state in-between filming ‘episodes’ of their dramatic and inspiring bush life. Pretty much the entire family was cited for faking Alaska citizenship in order to claim oil royalty benefits. What? Reality shows are fake? Next you’re going to tell me that wrestling is staged.